The Central Bank Governor in his recent statement at the Digital Banking summit stated that he felt like a charlatan when asked to speak about technology. He is right. This is not because, as he attributes it, of his recent acquisition of a smartphone but rather due to his regulatory lack of support for digital innovation. The Central Bank through its regulation of our payment and banking systems continues to pander to powerful financial interests. The Central Bank through its regulatory diktat from upon its fortress in Colombo Fort has chosen to strangle economic activity. Let us just take one situation wherein this is true. One massive instance of the Central Bank shunning a digital innovation. Let’s focus on transferring money. The prices as I face it, through Commercial Bank, are given below. As the largest non-state bank, I feel the costs are reflective of a broader truth in the economy. According to LankaClear’s website, “The Common Electronic Fund Transfer Switch (CEFTS) is an integral part of Sri Lanka’s trusted national payment network.” Our interbank payment network is poor. This is by design. Our antiquated means of transferring money, the large costs incurred in transacting, and the difficulty in transferring money all seek to serve vested interests. Looking at the tariff above you would be inclined to use a cheque book over a digitised transaction. It’s as if the post office has somehow become cheaper than Whatsapp or Email. Now to be fair, we on average may not even be aware of these charges as the banks we use tend to have amazing transfer mechanisms internal to the bank that are free, intuitive, and feature rich. Most major utility providers have accounts at all major banks and as such are accessible through these internal transfers. The impact of these charges and non-charges has a systemic impact on our economy. Think in terms of net neutrality. Through the inefficiency of interbank transfers, the regulator is pushing customers and therefore deposits to the banks it chooses. The regulator is also allowing banks to artificially improve CASA ratios by delaying the crediting of payments. As most shareholders will know even if it is that you have instructed the CDS to deposit cheques directly to your account it does not credit as set out by the company. Banks collude with each other to maintain slow realisation of transfers. For instance, my recent dividend cheque from Property Development PLC (subsidiary of Bank of Ceylon) to be credited on 8 June was only realised in my account on 28 June. 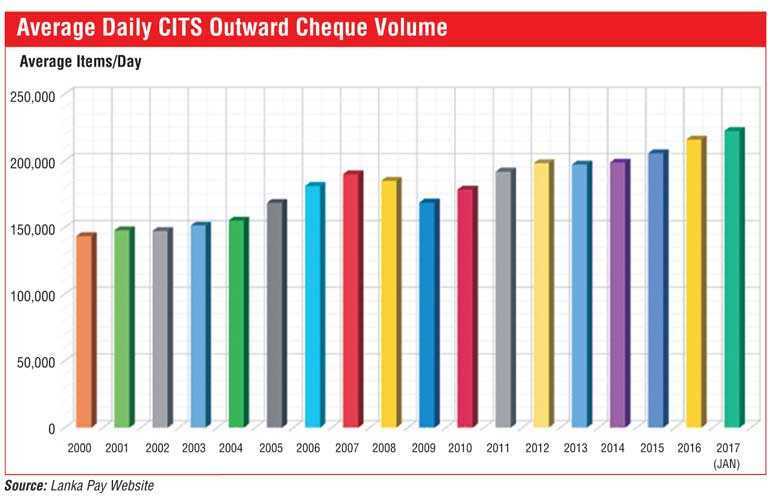 The wide usage of cheques in the economy also helps beneficiaries of Central Bank conspiracies to mask payments. To paraphrase Rajitha Senarathne fielding a question on a primary dealer, it is not unusual for a business to write many cheques and it takes a lot of time to trace where payment ended up. Small businesses wishing to automate the receipt of payments are also constrained into either only serving customers within a certain bank or having a costly online credit card payment portal. Sri Lanka’s merchant fees are well above the global average of .99% with smaller merchants having to pay as much as 3.5%. These fees can (and have been in Europe) be capped by the regulator. 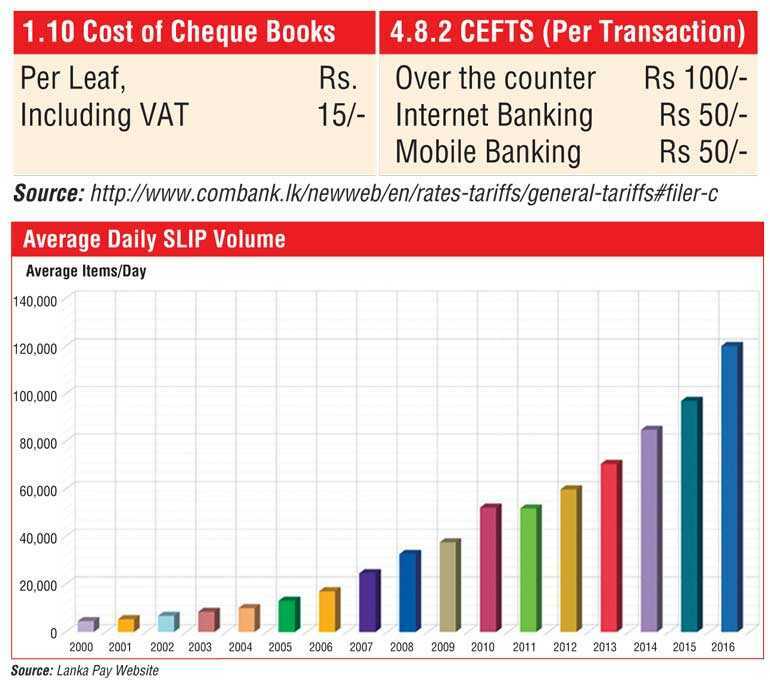 Why doesn’t the Central Bank reduce the price of CEFTS and SLIPS and increase the price of CITS and Cheque transfers? 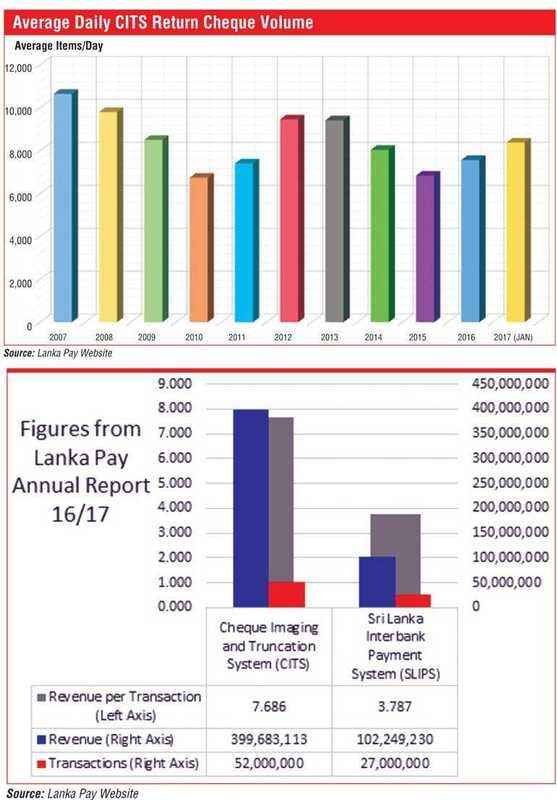 After all the costs by a calculation based on the figures from Lanka Pay’s annual report would suggest that the SLIPS system costs the bank less money. Initially because of the high costs and therefore high profits to the banks of cheque returns. More strongly though because of the entrenched interests in a poor payment system highlighted earlier.